The oldest handmade stone tools discovered yet predate any known humans and may have been wielded by an as-yet-unknown species, researchers say. The 3.3-million-year-old stone artifacts are the first direct evidence that early human ancestors may have possessed the mental abilities needed to figure out how to make razor-sharp stone tools. The discovery also rewrites the book on the kind of environmental and evolutionary pressures that drove the emergence of toolmaking. Ancient stone artifacts from East Africa were first uncovered at Olduvai Gorge in Tanzania in the mid-20th century. Those stone tools were later associated with fossils of the ancient human species Homo habilis, discovered in the 1960s. 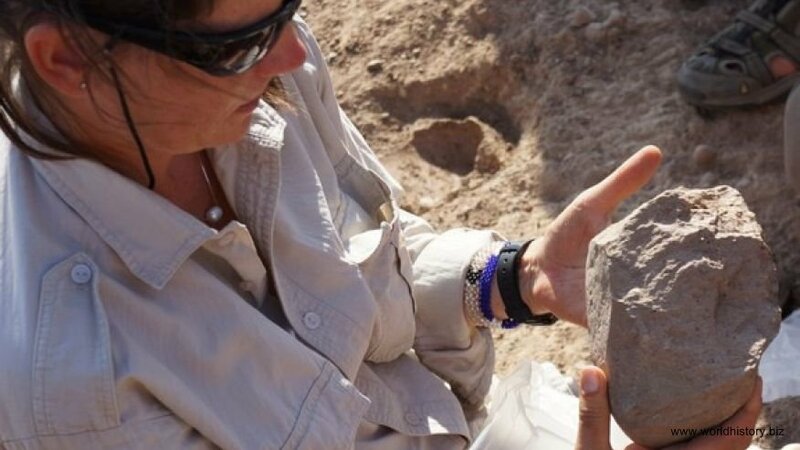 "The traditional view for decades was that the earliest stone tools were made by the first members of Homo," study lead author Sonia Harmand, an archaeologist at Stony Brook University in New York, told Live Science. "The idea was that our lineage alone took the cognitive leap of hitting stones together to strike off sharp flakes and that this was the foundation of our evolutionary success." However, there were hints of primitive tool use before Homo habilis. In 2009, researchers at Dikika, Ethiopia, dug up animal bones nearly 3.4 million years old that had slashes and other cut marks, evidence that someone used stones to trim flesh from bone and perhaps crush bones to get at the marrow inside. This is the earliest evidence of meat and marrow consumption by hominins — all the species leading to and including the human lineage after the split from the ancestors of chimpanzees. No tools were found at that site, so it was unclear whether the marks were made with handmade tools or just naturally sharp rocks. Now, scientists report stone artifacts that date back long before any known human fossils. Until now, the earliest known tools were about 2.8 million years old, the researchers said. The artifacts are by far the oldest handmade stone tools yet discovered — the previous record-holders, known as Oldowan stone tools, were about 2.6 million years old. "We were not surprised to find stone tools older than 2.6 million years, because paleoanthropologists have been saying for the last decade that they should be out there somewhere," Harmand said. "But we were surprised that the tools we found are so much older than the Oldowan, at 3.3 million years old." "Sometimes the best discoveries are the ones that raise more questions than provide answers," study co-author Jason Lewis, a paleoanthropologist at Stony Brook University and Rutgers University in New Jersey, told Live Science. "In any of these cases the story is equally new and interesting. We are comfortable not having all of the answers now." The stone tools were discovered in the desert badlands of northwestern Kenya, where the arid, rocky terrain resembles a New Mexican landscape. The artifacts were found next to Lake Turkana in 2011 almost by accident. "We were driving in the dry riverbed and took the left branch instead of the right, and got off course," Harmand said. "Essentially, we got lost and ended up in a new area that looked promising. Something was really unique about this place, we could tell that this zone had a lot of hidden areas just waiting to be explored." By the end of the 2012 field season, excavations at the site, named Lomekwi 3, had uncovered 149 "Lomekwian" stone artifacts linked with toolmaking. "It is really exciting and very moving to be the first person to pick up a stone artifact since its original maker put it down millions of years ago," Harmand said. The researchers tried using stones to knock off and shape so-called flakes or blades — a process known as knapping — to better understand how these Lomekwian stone artifacts might have been made. They concluded the techniques used may represent a stage between the pounding used by earlier hominins and the knapping of later toolmakers. "This is a momentous and well-researched discovery," paleoanthropologist Bernard Wood, a professor of human origins at George Washington University, who was not involved in the study, said in a statement. "I have seen some of these artifacts in the flesh, and I am convinced they were fashioned deliberately." Analysis of carbon isotopes in the soil and animal fossils at the site allowed the scientists to reconstruct what the vegetation there used to be like. This led to another surprise — back then, the area was a partially wooded, shrubby environment. "The Lomekwi 3 evidence suggests that important evolutionary changes that would later be really important for Homo to survive on the savannah were actually evolving beforehand, in a still-wooded environment," Lewis said. "The capabilities of our ancestors and the environmental forces leading to early stone technology are a great scientific mystery," Richard Potts, director of the Human Origins Program at the Smithsonian's National Museum of Natural History, who was not involved in the research, said in a statement. The newly dated tools "begin to lift the veil on that mystery, at an earlier time than expected." This discovery also has implications for understanding the evolution of the human brain, researchers said. Toolmaking required a level of dexterity and grip that suggests that changes in the brain and spinal tract needed for such activity could have evolved before 3.3 million years ago. The scientists are now looking at the surfaces and edges of the tools under microscopes and with laser scans to try to reconstruct how they were used, "and also studying the sediment in which they were found to search for trace elements or residues of any possible plant or animal tissues that could be left on them after use," Harmand said. The site is still under excavation, and Harmand said other artifacts could exist from early attempts at knapping. "We think there are older, even more rudimentary, stone tools out there to be found, and we will be looking for them over the coming field seasons," he added. The scientists detailed their findings in the May 21 issue of the journal Nature.